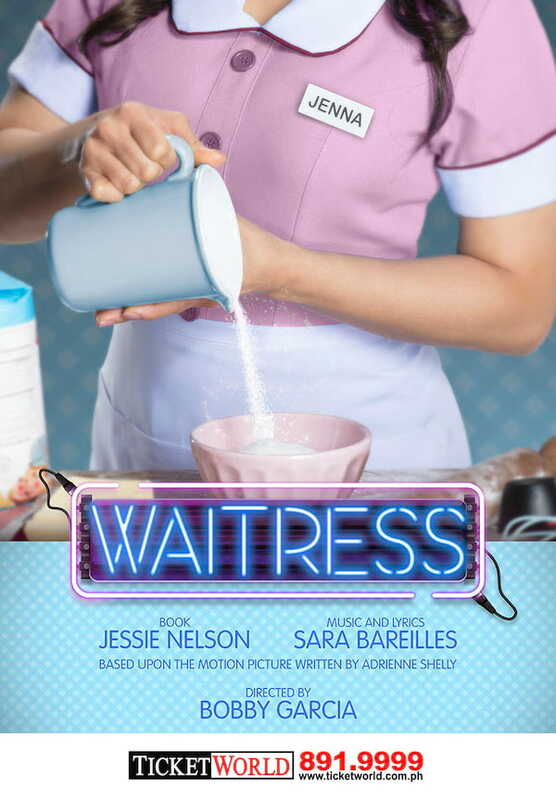 Waitress tells the story of a pie maker named Jenna who, despite the mundanity of her life, finds comfort and reckoning in the simple magic of baking. With the help of her two friends Dawn and Becky, she dreams of a way out of her loveless marriage and musters the courage to change her life for the better. 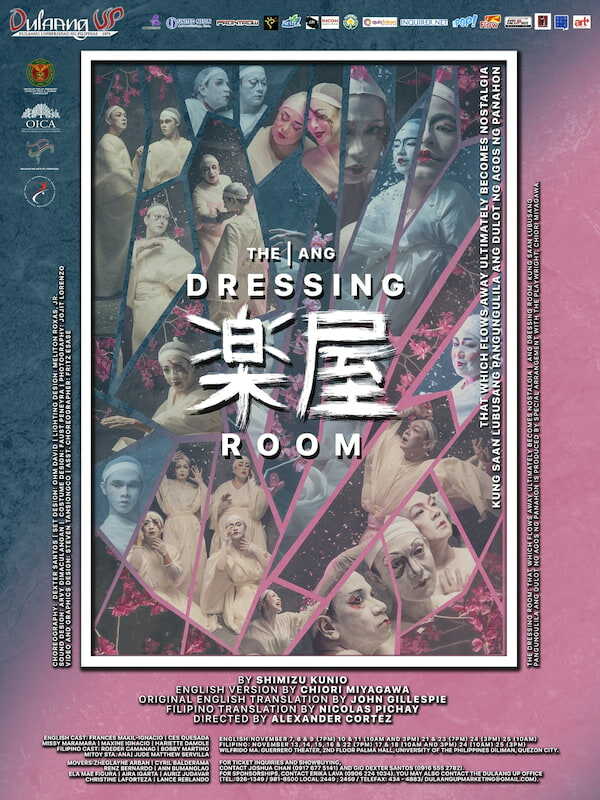 It is directed by Bobby Garcia, with choreography by Cecile Martinez, set design by Tony Award winner David Gallo, lighting design by Aaron Porter, musical direction by Farley Asuncion, costume design by Raven Ong, sound Design by Josh Millican, hair and make up design by Johann dela Fuente and vocal coaching by Manman Angsico. 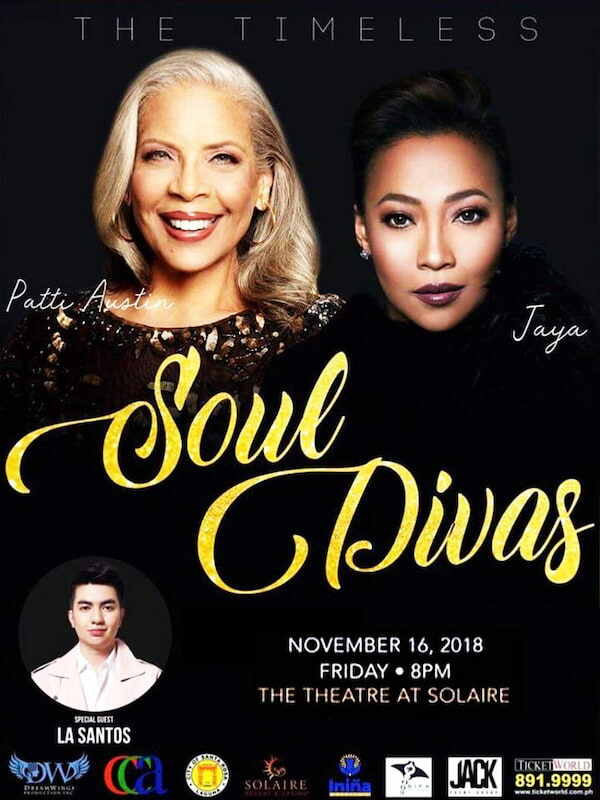 We are proud to announce International Soul Legend Patti Austin Music will be having a Series of Back to Back Concerts with The Philippines Queen of Soul Jaya. called "Soul Divas". Definitely this is the concert to watch for all bonafide music lovers and hopeless romantics of all generations. Tickets are priced from P1000 to P6200, and can be purchased via TicketWorld. 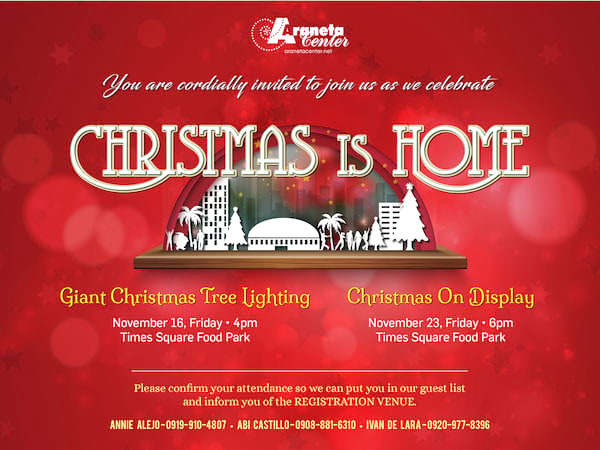 There is no Christmas like an Araneta Center Christmas. From the bright lights that adorn its streets during this time of the year to the grand events which are anticipated by a multitude of people, Araneta Center continues to spread cheer while honoring well-loved Christmas traditions. For the millions that visit the bustling commercial district, Christmas is truly home in Araneta Center. Since 1981, the lighting of the giant Christmas tree has been one of the most anticipated Christmas events in Metro Manila. This year, the 37-year-old tradition will take place on November 16 at the Times Square Food Park. The festive celebration will be attended by some of the country’s brightest stars including Vice Ganda, Darren Espanto, Hashtag McCoy de Leon, TNT Boys, Janine Berdin, Vivoree Esclito, Hashtag CK Kieron, and The Kids’ Choice” jurors Xia Vigor, Chunsa Jung, Onyok Pineda, Carlo Mendoza and Jayden Villegas. The show will be hosted by sports personality-turned-news anchor Gretchen Ho, theater actor Benj Manalo and stand-up comedian MC. The season’s bells are tolling as we are almost a month away from Christmas! 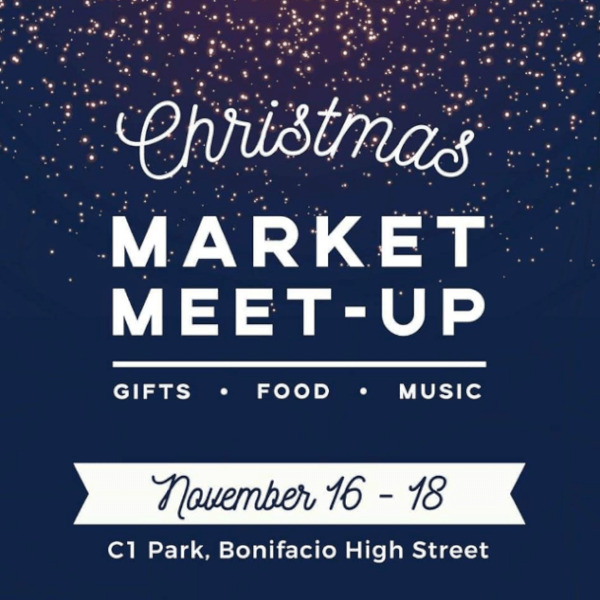 The Christmas Market Meet-Up, happening at C1 Park in Bonifacio High Street, offers up an unforgettable shopping experience partnered with classy music and sumptuous food. Our locally-sourced vendors will display unique gift-able items perfect for your loved ones. 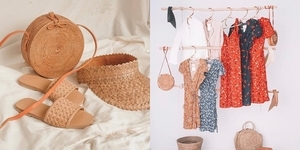 Sip.ph will be selling items your environmentally-conscious friend would prefer, like metal straws and sustainable cutlery. Lana.ph will also be making an appearance, showcasing aromatic shampoo bars and organic skin care products compatible for any. Or perhaps you could give your relatives some greenery to light up their home with Happy Plant Co. and their wide selection of indoor plants potted in beautiful baskets. Revel in these season’s gifts as a jazz band plays every Saturday and Sunday from 7:00 to 8:30. Waltz through the gift-able showcase and munch on some freshly baked cookies straight from the oven by Cookies by the Bucket. Enjoy good food and a warm environment and drop by The Christmas Market Meet-Up, brought to you by Urbanpod Events. See you there! Sweet, rock and a whole lot of bold, the 90s were an era of statement making music that shook the core and revitalized Philippine music. 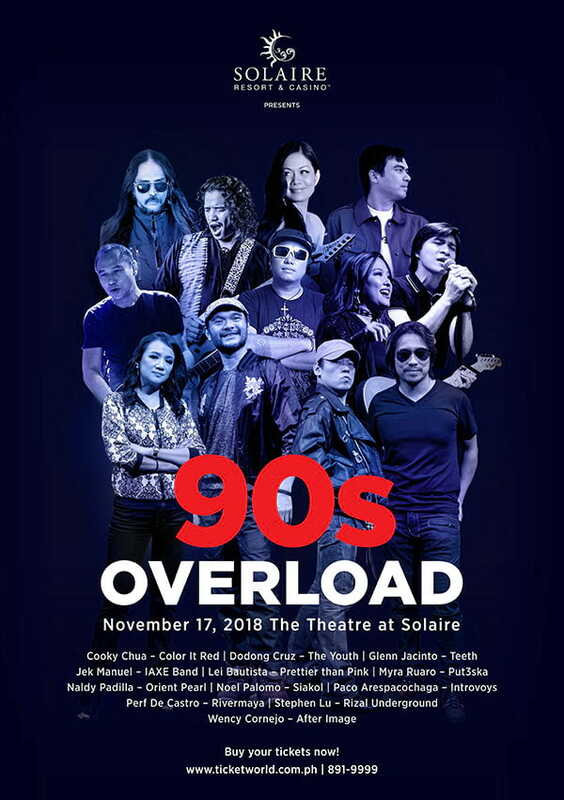 Hear the pulse raising hits in “90s Overload” happening on November 17, 2018 at The Theatre at Solaire. “90s Overload reminisces the era when Original Pilipino Music (OPM) found its footing in the rock scene. The grungy, attitude-filled acoustics merged with the soulful lyrics that is normally the signature of our ballads were what made it appealing and relatable. The 90s music were statement makers which made them click with a wide audience then, and even with today’s younger generation,” says Solaire Resort & Casino’s Director for Entertainment Audie Gemora. The concert will bring together the 90s most iconic band voices to sweep its audience onto its currents. Jek Manuel of IAXE Band, Cooky Chua of Color It Red, Lei Bautista of Prettier than Pink, Paco Arespacochaga of Introvoys, Perf De Castro of Rivermaya, Glenn Jacinto of Teeth, Wency Cornejo of After Image, Myra Ruaro of Put3ska, Naldy Padilla of Orient Pearl, Dodong Cruz of The Youth, Stephen Lu of Rizal Underground and Noel Palomo of Siakol will sing their most prolific songs to bring in the nostalgia tide after tide. Your favourite shop and lounge destination is celebrating its third birthday! 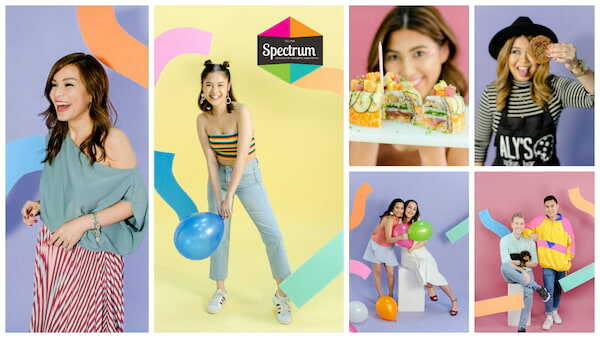 As we celebrate three fun and colourful years of Spectrum Fair, mother-daughter duo Pia and Alyssa Arellano are cooking up the most exciting shopping experience of the season. Kick-off your Christmas shopping with old favorites and new exciting finds one can only expect from Spectrum Fair Manila. Everyone is in for a treat as the country’s most Instagram-worthy fair is back for all your fashion, gourmet, and lifestyle needs. Its birthday bash guest list is star-studded with Manila’s most lifestyle-savvy bunch. Spectrum Fair’s masterful curation of its indoor-outdoor setting endears the whole fair to shoppers of all ages. Families have made it a habit to drop by the fair to score great deals for parents, children and pets too! Shop and lounge with your family and friends at Spectrum Fair on September 15-16, 2018 at Whitespace Manila. See you there! 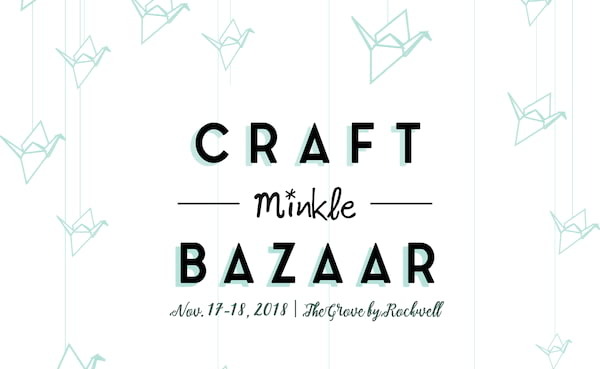 Happening on November 17-18 at The Grove by Rockwell. As veganism become more popular in the country, VegFest Pilipinas is bigger and better! 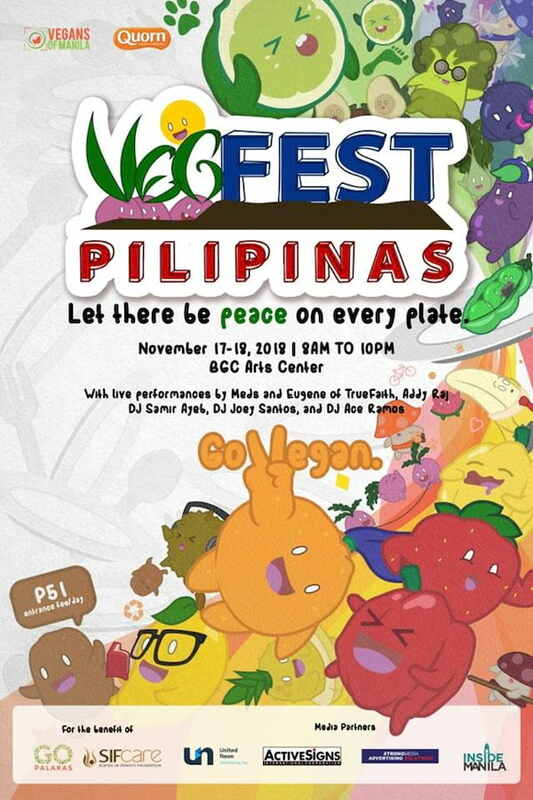 “Let There Be Peace On Every Plate” is this year’s VegFest Pilipinas theme and the 80 all-vegan merchants of the most awaited festival will prove that vegan food can be delicious, fun and exciting to eat, without the artery-blocking cholesterol and all the violence that comes with eating meat. Save the date, it’s going to be on November 17-18, 2018 at BGC Arts Center, from 8 am to 10 pm. Each day is packed with activities such as yoga and fitness classes, cooking demos, educational talks and games. A global shift to a plant-based diet is said to be the single most effective way of combatting the effects of climate change, as the United Nations point out that animal agriculture is the main contributor to global warming. VegFest Pilipinas is our yearly festival to celebrate the solution to this global problem in the most fun way. Come join us! Everyone is welcome! 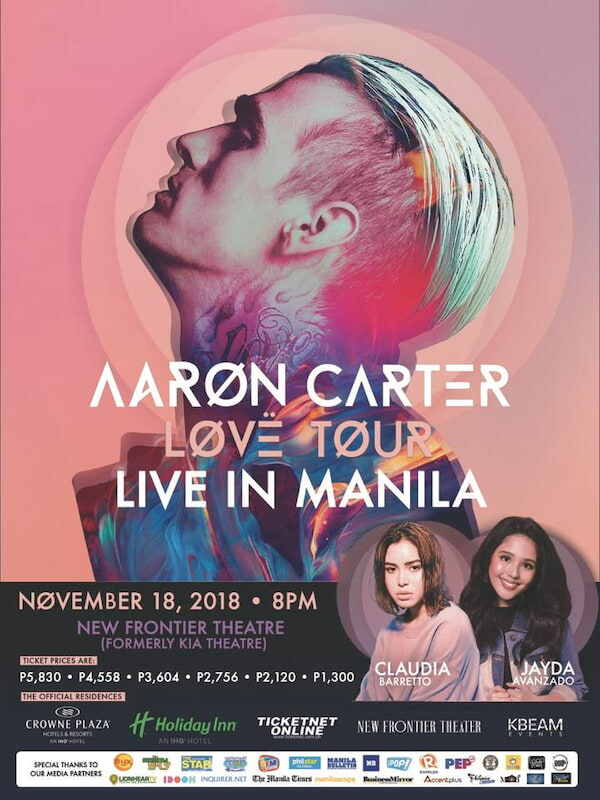 Kbeam Events officially announces the upcoming concert of 90’s teen sensation, Aaron Carter dubbed as “Aaron Carter LØVË Tour Live in Manila” on Sunday, November 18, 2018 at New Frontier Theater (Formerly Kia Theater) at 8pm on Sunday, November 18, 2018. Aaron Carter Live in Manila will also feature performances by teen popstars Jayda Avanzado and Claudia Barretto. The singer, songwriter, and producer who has taken the 90’s and early 2000s by storm with hit singles “I Want Candy,” “I’m All About You,” and “Crush on You,” will be featuring his latest album release LØVË. One of his hit singles in the album “Sooner or Later” went Gold in several countries in Europe and is now enjoying multi-million streams on Spotify. Tickets to Aaron Carter Live in Manila are now on sale at all Ticketnet outlets, call 911-5555 and at Ticketnet.com.ph. Prices are at P5,830, P4,558, P2,756, P2,120. A new section is also added to accommodate more fans – General admission with the ticket price of P1,300. 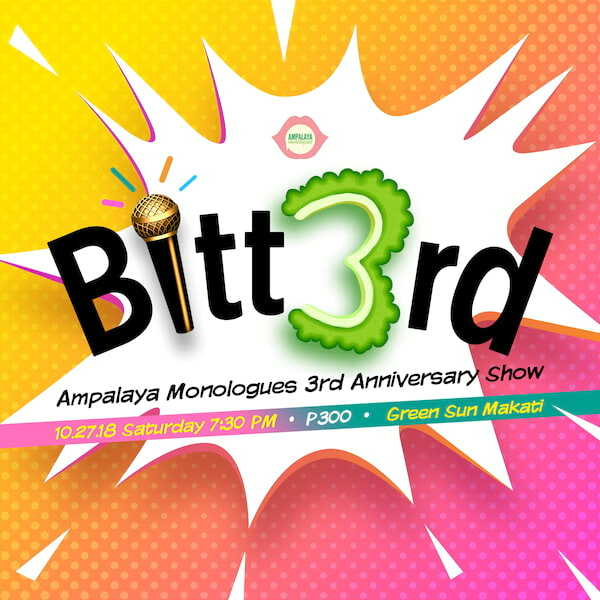 A new set of Ampalaya Monologues will come to life for the show’s third anniversary dubbed as “Bitt3rd.” This set is said to be the deepest, funniest and most relatable to date. Ampalaya Monologues is an episodic play that has been staged in various venues around the country. The show has been recreated into different versions and now has a collection of over 70 monologues, all written by Mark Ghosn. On each show one promise has been kept, you may come in bitter but you will definitely come out feeling better. On October 27, 2018, at Axon at Green Sun, there would be two kinds of people. Those who drink and those who cause the urge to drink. Ampalaya Monologues asks, “Which one will you be?” As the night unfolds, interconnected stories of those who have taken chances find themselves to be both through their own and others’ experiences. #Bitt3rd - The Ampalaya Monologues Anniversary show will be from 730PM to 10PM at Green Sun, Makati with tickets at P300 each. Message Ampalaya Monologues at www.m.me/ampalayamonologues to reserve your tickets!